9/10 in WIRED’s App Guide - Selected as an Honoree in the Webby Awards - Featured in CNN’s 50 Ultimate Travel Apps ALSO FEATURED BY: The New York Times, Los Angeles Times, msnbc, ABC News, Wall Street Journal, USA TODAY, The Washington Post, Travel + Leisure… UNIQUE FEATURES: - 100% OFFLINE – NO INTERNET CONNECTION REQUIRED except for sharing and updates. - TRAVEL GUIDE with attractions, museums, restaurants, bars, hotels, theatres and shops with TRAVELER REVIEWS and RATINGS, pictures, rich travel info, prices and opening hours. 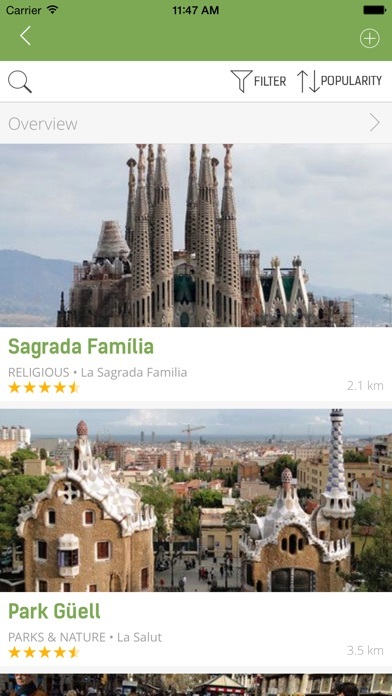 - PERSONALIZED TRIP ITINERARIES - Exclusive technology - The Trip Genius automatically creates personalized trip itineraries according to your travel interests, pace preference, trip dates, accommodation, personalized favorites, location and opening hours of places as well as ratings from other travelers. Use smart order to rearrange your visits and customize your itinerary at any time. - OFFLINE MAP & DIRECTIONS - The only guide with offline navigation! - Have the guide locate you on the map and provide you with directions to a place by foot or by subway. Use all map and direction features 100% offline with no roaming fees! 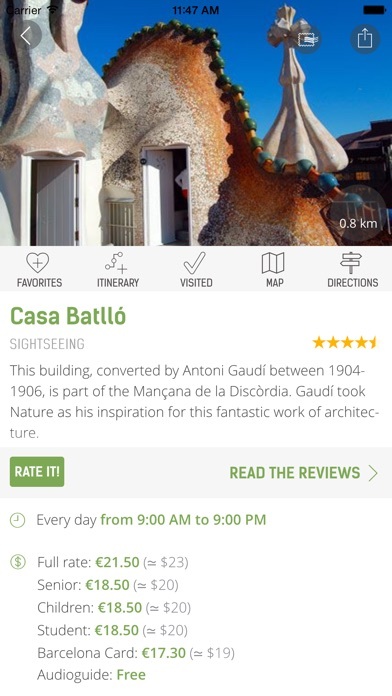 - AUGMENTED REALITY - View your environment and all the places to visit in real-time, with distance, ratings, prices and opening hours. - TRIP JOURNAL - NEW FEATURE - Easily create and share a trip journal with your check-ins, pictures, and comments! - SHARING – Share your check-ins, postcards, pictures, reviews and trip journal by email or Facebook. Items are stored on your device and sent automatically when a free internet connection is available! - TRIP DASHBOARD - Available at www.mtrip.me, the trip dashboard gathers your trip journals, itineraries, and favorite places from all of your destinations in one place. 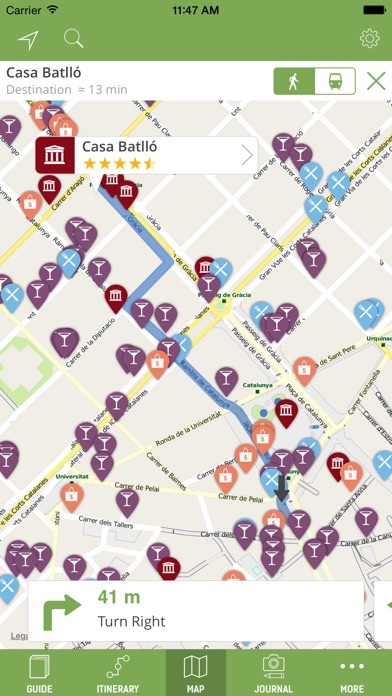 You can share it with friends and print your itineraries! - TRANSFER YOUR ITINERARY between devices and back them up online - OTHER FEATURES – Send pictures and postcards by email or Facebook, easily discover new places, currency converter, subway map, add personal places and more! To explore mTrip’s other destinations please visit www.mtrip.com mTrip’s Hong Kong Travel Guide is available in: English, French, and German MTRIP IN THE NEWS! LA TIMES - “App maker mTrip's signature Genius will generate an itinerary for you based on your preferences” NEW YORK TIMES - “Travelers with iPhones should add mTrip to their augmented reality specialty apps list” THE WALL STREET JOURNAL - “These next-gen travel guides can take care of stress-inducing itinerary-planning in Asia, Europe and the U.S." ASSOCIATED PRESS - “The new iPhone application mTrip is a travel guide and then some: It uses the latest in smart phone technology to make it easier to stay on track in a foreign locale” IPHONE LIFE - "Don't travel without them” TECH VIBES - "Actually knowing what I'm doing and where I'm going in a world otherwise new to me... priceless" For any questions please contact support@mtrip.com. We are happy to answer your questions. I downloaded three Barcelona applications for my trip, and this one was by far the most useful. The ability to save favorite spots on the offline maps, access their details with a single touch, and obtain turn-by-turn directions from my current location were incredibly helpful as I explored the city. Offline Maps are "off da hook"
I'm not sure how it works but its amazing... The offline map know exactly where you are and gives you directions to anyplace you like... I am a believer. A big help in Barcelona! 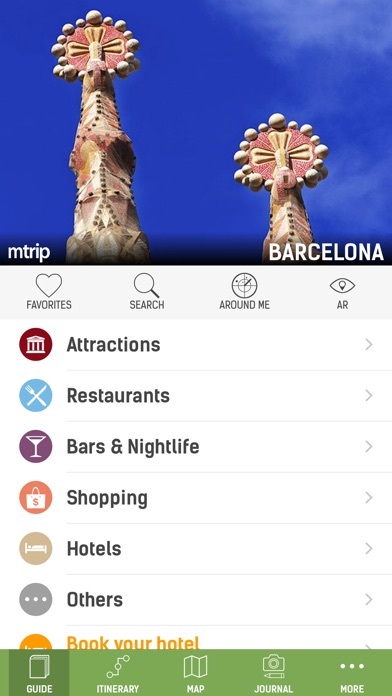 Used this app on a recent trip to Barcelona, and loved it. The offline maps were terrific. Plus the app recommended a restaurant that turned out to be one of the highlights of the trip. Lots of good info, easy to use. Would give it 5 stars but my one problem with it was that the turn by turn navigation was confusing. Great app, perfect replacement for a book, good chance for user input! Useful information on lodging, restaurants, sights, history, culture and more. Love the navigation tools for directions and the sharing of photos, reviews and more through integration with Fscebook. Very helpful got us where we needed to be without any Internet connection! Great app. Thanks. The navigation service works like a charm. Like a personal planner the itinerary was great. It would be nice to improve the restaurant selection(e.g add Michelin rated or zagat rated). For people who don't eat ham Spain is a challenging place to find food. 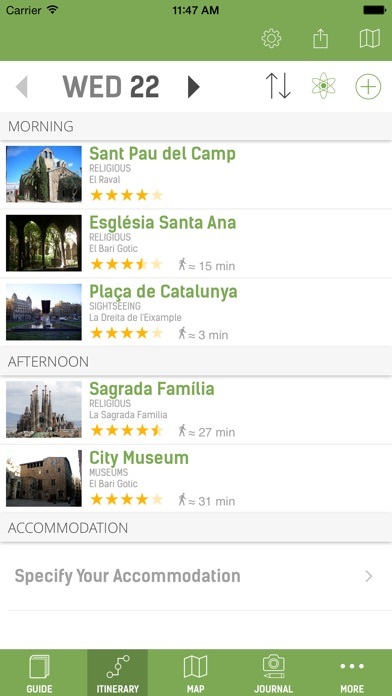 We used this app while in Barcelona and it was very helpful in setting our itinerary. The descriptions of attractions were excellent and directions also very good. The only issue was that sometimes it was difficult to follow the directions in the alleys and streets of the Gothic Quarter.